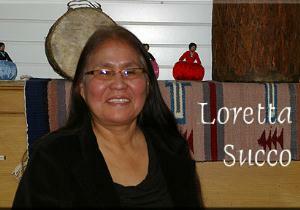 Loretta has been a weaver since she was 9 years old. She was taught by her mother. She makes all kinds of blankets and uses natural and handspun wool as well as some commercial wool. Chief Blankets, Eye-Dazzler, Yei-be-chei, Pictorial, Sand Painting, Flags, and Wide Ruins styles are just some of the things she does.